My very own brand of CLEAN, VEGAN, NON-GMO, GLUTEN FREE, DAIRY FREE, SOY FREE nutritional supplements. I have put my heart and soul into developing Nutritionary in an effort to help women and men make sustainable lifestyle changes. I am thrilled to share my PASSION for nutrition with you. I am always adding new products so tune in to EVINE TV Network to check them out, and experience a new way of living a healthier life with Nutritionary. Even if you are already eating clean and balanced you may still not be getting the nutrients you need from your food supply. Allow Nutritionary and my delicious Chocolate Greens mix to help support your diet with the goodness of phytonutrient rich fruits, vegetables and greens in an easy to use drink mix. My clean super foods meal replacement is perfect for those looking for a great in-between meal snack or a quick meal that adds protein, vitamins and minerals as part of a healthy diet. Perfect for those who always skip breakfast or get home too late to make a meal. It comes in two delicious flavors and can be whipped up in seconds by simply mixing with a cold glass of water or another favorite beverage. Great for anyone who wants to add a delicious superfood antioxidant drink to their diet. 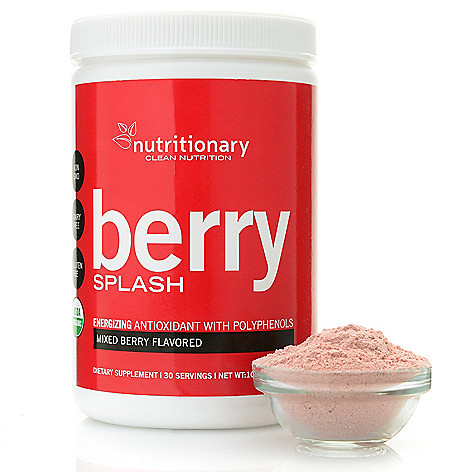 Berry Splash powder is made with a proprietary potent antioxidant Aurora Blue complex, an Alaskan Blueberry blend wild harvested from the Alaskan rainforest and tundra. This complex features Organic Blueberry, Oval-leaf Blueberry, Alpine Blueberry and Dwarf Bilberry.